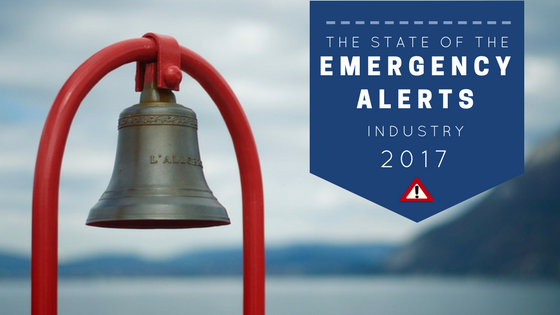 What’s Happening in the Emergency Alerts Industry in 2017? From the first very first smoke signals created by prehistoric men to the 9-1-1 phone system, the emergency communication industry has vastly matured throughout the ages. Now, in 2017, we’re at the peak of the information age. You can access nearly any news, from virtually anywhere in the world, any time. Amber alerts, text message notifications, and phone recordings can inform the masses, instantly, of any crisis. Whether it’s to let us know about a school cancellation or a natural disaster, this is the current state of emergency alerts. How Do Emergency Mass Notification Systems Work? The need for the ability to send out crisis alerts is steadily increasing. One of the latest trends emerging is the high-volume use of mass notification systems (MNS) across multiple industries. So, how does this kind of system work? In a nutshell, an MNS sends a one-way message to employees, subscribers, or the public regardingan emergency in real-time by way of telephone, text message, email, television, or radio. These systems make it easy for municipalities, companies, and individuals to let their people know that something is outside of the norm. Where the average response time for the police is 11 minutes, a mass notification system can be sent instantly in a safe, discreet way. Emergency alerts are still sent out via broadcast television and radio, and phone calls are still used. Today, though, when 77% of people own a smartphone, the trends in technology tell us that it’s time to start taking a closer look at email and text message alerts. Why Are Mass Notifications a Critical Part of Society Today? It takes the average company 18.5 hours to recover from a disaster. 40% of organizations rated their ability to recover from a disaster as fair or poor. Three out of four businesses fail at disaster recovery (source). Since 2013, there have been over 200 school shootings in America. In the past 35 years, an estimated 2.5 million lives have been lost to natural disasters. 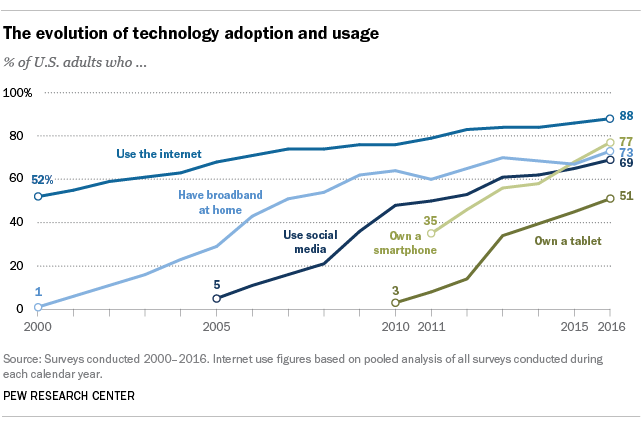 49% of US households are wireless-only (no landlines). Americans spend approximately 26 minutes texting each day. Americans send and receive an average of five times as many texts as they do phone calls. Text messaging is the most widely used smartphone feature. 97% of smartphone owners have used text messaging (source). Emergency preparedness can decrease violent crimes by up to 12% and property crimes by up to 24%. Emergency alerts policy implementation has decreased felony crimes in NYC by up to 5%. 54% of workers want to know about workplace closures via text message. 10% of workers are interested in public health news delivered via text message . The need to act in an appropriate manner is immediate during an emergency, followed by the need to communicate. Amber alerts have a 20% success rate of recovering missing children. What New MNS Capabilities are Available? We’ve already seen what can happen with advanced smartphone technologies. For example, in some states, anyone who opts-in can see immediate notification of an Amber Alert almost as soon as local missing children reports are filed. One patent filed with the USPTO, published in March, will allow a “multimodal notification system” to assist with data capture. This means that voice will soon be a new input method for MNS administration. Various spoken prompts will enhance and improve the ease-of-use for many emergency systems. Who Uses Mass Notification Systems to Inform People of Trouble? The FCC’s Emergency Alert System (EAS) is probably the most well-known MNS in the United States. You can hear the dreaded sound in your mind, followed by, “This is a test from the American Broadcast System.” When your favorite song or television show is interrupted, it is an annoyance. But, when there is an actual emergency, recognizing the sound can save your life. Who else uses an MNS to send communications? Despite what some might think, emergency mass notification systems aren’t isolated to government agency use. As a matter of fact, over the next two years, according to research conducted by Frost & Sullivan, the global emergency response market is expected to reach $132 billion. Following Asia and the Pacific, North America accounts for the greatest portion of this financial estimate. Additionally, the South American market share is predicted to eventually pass European spending. In addition to the predicted municipalities, sectors like schools and businesses have started coming to us for their emergency notification system needs. An MNS could appeal to any business or government agency for various reasons. What Are People Using These Systems For? The growing need for all types of emergency alert systems is illustrated above. Let’s look at some recent case studies to see how people are using these systems. The first item that comes to mind is the prospect of a terrorist attack or natural disaster. These are very real threats as we’ve seen throughout the world in recent years. When everyone in the vicinity of a location can receive instructions on whether to stay put or evacuate, further detriment is often avoided. Livingston County is just one place in the U.S. who’s taking steps to improve their approach, spending $35,000 this year on a new emergency alert system that should give citizens peace of mind. In the wake of heightened terror threats, people in this area can opt-in to receive notifications via phone, email, or text message in case of a dangerous situation in the community. All landline phones in the area were automatically signed up to receive communications under this plan, and more people are subscribing to the system. Cities all over the nation are implementing similar frameworks. Many high schools and colleges currently use mass notification systems to notify parents of school-wide emergencies, late starts, and snow days as well as individual absences and tardies. The administrative duties of teachers and staff at this level can be overwhelming. Mass notifications provide a solution to decrease workload and increase parent satisfaction. Lomira County in Wisconsin recently launched a new mass notification program in their school district. They will pull information from student enrollment files to reach parents, notifying them via phone, email, and text. The calls and messages will inform the guardians of students when school is closed, delayed, or released early, or in emergency situations. As a convenience, parents can easily login at the district website to change and update information in case of a move or other change to contact information. Businesses use emergency alerts for both internal employee and customer notifications. Say there is a safety issue with a specific product, it can be invaluable to let your customers who you know have purchased this product of a recall. Imagine you’ve had a security breach at work and the authorities have been notified, but you want to send safety instructions to your employees; mass notifications can be the best way to let people know what you expect of them and how they can remain safe. Organizations across the US and Canada use DialMyCalls for their emergency notification needs. Among these are Georgia Pacific, Goodwill, Chrysler, and YMCA. Emergency texting, product recalls, and reverse 911 are among the most popular uses of our system for businesses. The story behind Amber Alerts is tragic yet inspiring. After losing their 9-year-old daughter, Amber, to a brutal murder, a couple decided to dedicate their lives to finding lost children. From this terrible situation, a new mass notification system was born that has saved the lives of hundreds of children. It was noted, in 2015, that 800 children had been safely returned to their homes specifically because of Amber Alerts at that time. Since then, it’s unknown how many more have been rescued. The Wireless Emergency Alert program associated with this system now distributes timely, advanced notifications from local municipalities when a child is abducted or missing. The state of the emergency alerts industry has a heightened focus on text message and email notifications that is up-to-date with consumer use of technology. The future holds more evolved technologies that should allow us to use voice prompts hence more control over our distribution methods. Anyone can use these systems to create a safer environment in homes, offices, and at the local, regional, and federal level. Try DialMyCalls for free to see how you can use our system to protect yourself and those around you.